Saving monthly is one of the most effective ways of investing and is also one of the safest providing you have a medium to long-term time frame (5 Years +). 2008 have understandably caused some investors to worry about the downside risk to their investments. However, it is possible to make volatility work to your advantage. Saving monthly offers a potential benefit known as ‘unit-cost averaging’. Whilst this sounds complicated it simply means that if the market falls, then your regular fixed monthly investment will buy more units, because the price of each unit you are buying will be lower. In a rising market fewer shares will be purchased, but your existing shares will have gone up in value. The fact more shares are purchased when the price is low and fewer when the price is high can result in the average share price paid being lower than the average share price over a period of a number of years. In month one, the unit price is 100c and so the 100 SFr investment buys 100 units. In the subsequent four months the price of the units gradually falls and so more units are purchased for the 100 SFr invested each month. As the unit price reaches its lowest point in month five, the most units are purchased for any one-month period. From month five the unit price begins to rise, reaching its highest point in month 10, where the fewest units are purchased for 100 SFr. 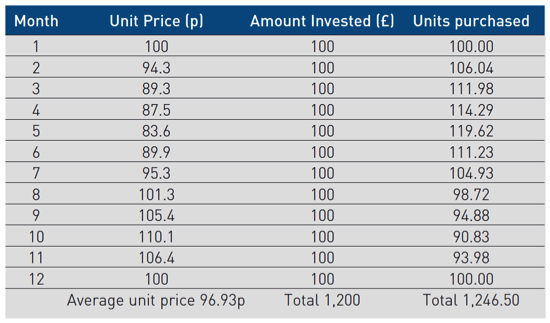 In this example, saving monthly results in 46.5 more units being purchased than through a lump sum investment, because more units are purchased when the price is below 100c and fewer when the price is above 100c. The diagram below illustrates that a 100 SFr a month regular investment buys more units as the price falls and fewer when the unit price rises. The chart below illustrates how 100 SFr per month invested in the FTSE All Share from the beginning of 2000 to the end of 2009 would have performed against a lump sum investment of 12,000 (100 x 12 months x 10 years). Over this period, monthly investing has produced both a smoother return and a greater return overall. The fall in the market between 2000 and 2003, and 2007 and 2009, meant that regular monthly investment purchased more units and increased the value of the investment when the market recovered. Reduce the risk of putting all your money into the market just prior to a market correction. The Power of Compound Interest shows how you can really put your money to work and watch it grow. When you earn interest on your savings, that interest then earns interest on itself and this amount is compounded monthly. Over the medium to long term this will have a significant impact on your overall returns. 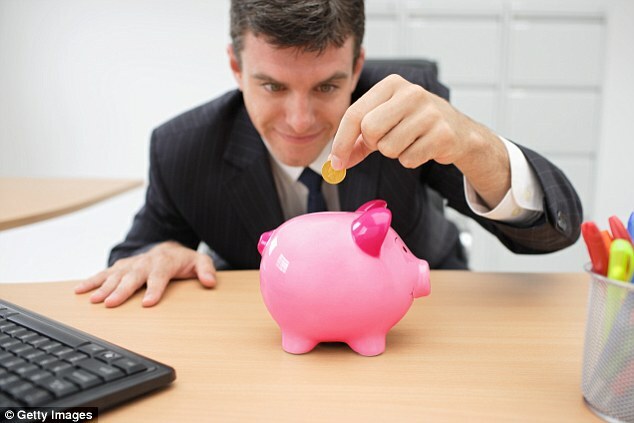 Once you have calculated how much you can comfortably afford to save on a regular basis you need to find a suitable savings account that will generate the growth on your contributions. With interest rates so low you will need to take some element of risk if you wish to target returns above inflation. We recommend that you speak with your financial advisor so they can explain all of the available options to you. Should you not currently have an advisor our team at SuisseRock Advisory Services will be more than happy to help. Simply leave your contact information below and we will contact you shortly to discuss your options.